Firstly i have to say that i'm not a big fan of Miike...in fact after having seen almost all of his released works i'm still think that is one of the most overrated directors...along with Kitamura. As for the movie, i think it's one of Miike movies i have enjoyed more with, you won't stop laughing. 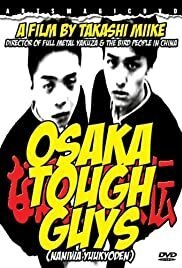 In fact this is more a comedy where the Yakuza world is totally mocked than an action or crime movie, and there is no trace of the typical bizarre things, Miike has become popular for.